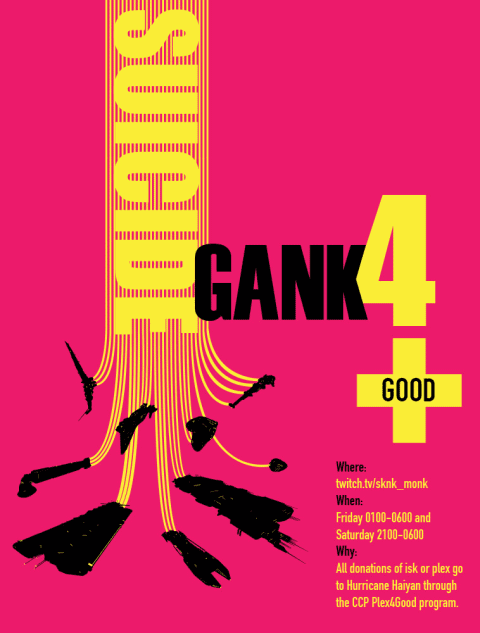 From 21:00 EVEtime today (possibly earlier) and through the night, the final day of the SuicideGank4Good event takes place. As we told you a few days ago, Psychotic Monk is running a Twitch.tv stream for CCP's "PLEX For Good" program, which allows players to donate isk that CCP will translate into disaster relief for the Philippines. During Psychotic Monk's "SuicideGank4Good" event, you can watch him and his friends suicide ganking miners as they raise money for charity. They have already shattered their initial goals, and have raised over 100 billion isk! That translates into thousands of dollars to help those affected by the typhoon that hit the Philippines last month. NOTE: CCP has stated that they will permaban anyone who runs a scam related to the PLEX For Good program, so you can rest assured that this is legit. On the stream, Psychotic Monk will let you know the name of the character to whom you should send your donations. You can read more about this event on his EVE-O post. In addition to other festivities, Psychotic Monk will hold an auction for my original "Invincible Stabber". 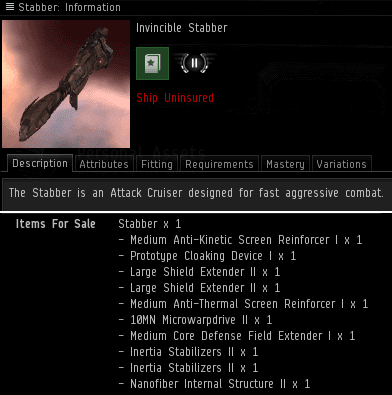 The first ship that I ever used for bumping miners, this Stabber predates the New Order. As with the rest of the money received during this event, the isk will help people in the Philippines. At what time during the event will the auction be held? That's up to Psychotic Monk, so you'll have to watch his Twitch stream to find out! Last night was awesome as we had around 30 catalyst pilots in fleet engaging noncompliant miners repeatedly for a good real world cause. Donors (including Eve-Kill) said that not only did they enjoy helping, but they really enjoyed watching the stream and participating. I loved it wenn Host started to whine "oh man let me alone, i have to get that carrier, when he was took down by a machariel. Or when someone ticked of one of the targets. Or when some of the dimwhits mentioned that they are on a "good misson" and it woulnd be ok, to keep you suckers from ganking, since you would do it for honorable reason". You often call carebears iliterate, but yout examples of stupid gankers is a show for it self. *Nothing*, *no* excuse ever, makes your type of ganking honorable, makes dimwhits into knights. I was only surprised how grownup the voices in the chat sounded. You are lacking even one whit of wit.